Although they have been around for several years, virtual desktop and application virtualization solutions have not yet gone mainstream in most enterprises. That’s bound to change, however, given advances in the technologies and the increasing need to deliver a great computing experience to mobile device users. 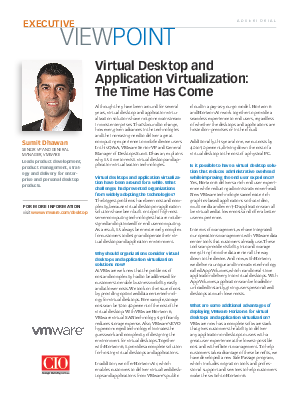 Read this Executive Viewpoint Q&A with VMware Senior VP and General Manager of Desktops Sumit Dhawan, as he explains why it’s time to revisit virtual desktop and application virtualization technologies.